Filed to: Hell Yeah!Filed to: Hell Yeah! Hell Yeah! is the story of an undead rabbit prince, who got caught in an unfortunate, public scandal when pictures of him surfaced doing...questionable things with a rubber ducky. Now all the demons in the underworld are laughing at him. And he's going to take his vengeance out one split skull and shredded muscles at a time. If you think the storyline setup is juvenile, just wait until you get to the jokes, which surface in everything from the visuals of demons in the shape of poop (yes, poop) to the dialogue to the HUD (which shows your health as F**k! blood when it's down to alarming levels). Hell Yeah! doesn't take itself very seriously, and that makes it a game that's hard to play with a straight face on. 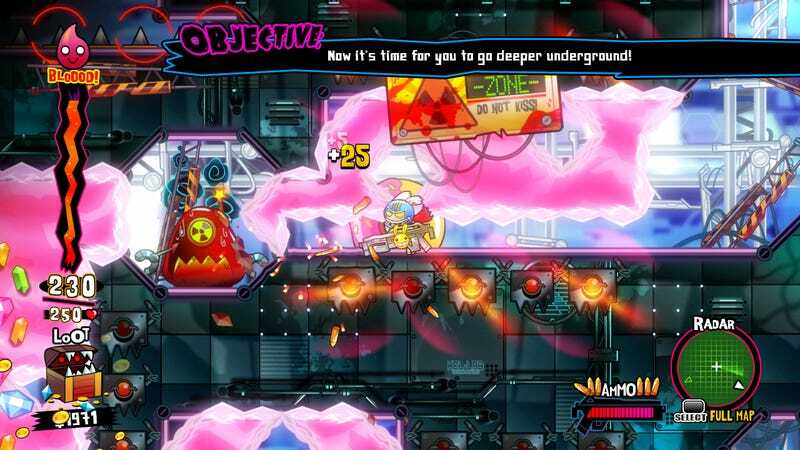 The platformer is full of bright colors and quirky creatures. I think the tall dancing panda shooting pink missiles might be my favorite. But that's just one example of some of the fun designs of creatures you'll be slicing up. The fact that the game's entire art was done by one guy makes it all the more impressive. Playing as the dead rabbit, you are equipped with a jetpack/chainsaw circular mechanism-thing. You can use it to fly up through passageways or slice through enemies. You've also got a missile launcher attacked for those enemies that are harder to get closer to. Each level, of which I only got to see three, is vastly different visually. The game starts off in your typical hell lair, full of lava and spikes and other nefarious obstacles. As you move on, though, you'll get to more industrial-looking levels with robots (and dancing pandas). You hunt down the demons that dare mock you, laughing about picture evidence caught on the Internet. Each demon you kill gives you their soul and some money to spend for upgrades like weapons and new skins (I bought a pink donut skin for my jetpack/chainsaw). The best part about battling them is that each is killed off with an entirely unique execution move. By either button-mashing or button-mash timing, you'll set off a new and hilarious animation. These execution animations are often references to games. One saw a Space Invaders attack on the demon, while the next properly-hit command inserts a coin into an arcade and drops the machine on the demon's head. I laughed pretty much the entire time of playing Hell Yeah!. Everything about Hell Yeah! is ridiculous and fun. Platforming feels challenging, with a ton of obstacles and freakish-yet-hilarious animations in your way. Even replenishing your health (the blood mentioned earlier) leads with a bunch of silly-looking, puffy-lipped nurses bubbling around you.